I’m so excited my friend Darykk agreed to find time in her insane schedule to share her story as part of the summer of small voices. I think you will agree there is nothing small about her ambition, or the impact she and women like her are making on the world. Going to law school in itself isn’t all that remarkable. Plenty of people do. What makes my story different is that I was the first person in my family to graduate high school. Granted, it was a really crappy high school, but nonetheless, I graduated. Not only that, I graduated 7 months pregnant by my after school fast food job supervisor, who was 21 years my senior, and who made sure I knew he didn’t love me, he just married me because it was the right thing to do. That’s every mother’s dream for their little girl, right? 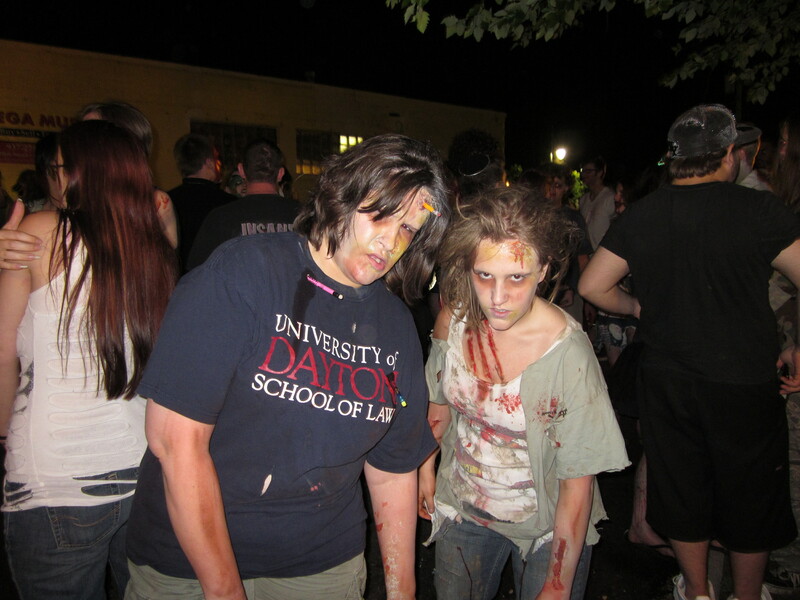 my daughter and I are not always zombies, but when we are we do it right! Needless to say, the ex-husband was less than supportive, but I managed to make even that work to my advantage. I didn’t like being home, so I poured every ounce of my time and energy into making sure my daughter had every opportunity I had stupidly denied myself. I worked 2, sometimes 3, jobs. I went to school in the evenings. I enrolled my daughter in one of the best schools in the state and I volunteered. I coached her creative problem solving team, worked part-time in her cafeteria, hosted her school talent show and so on. I nurtured her talents and ambitions and, while I won’t say it’s right for every child, I kept her busy with activities that she enjoyed and that boosted her self-esteem and self-confidence. My daughter is by far my greatest accomplishment. She is about to start her freshman year of college and everyone who knows her thinks she is pretty much the greatest kid who ever lived. Though I’m not here to talk about her, my daughter really is the guiding force who helped me to get where I am. 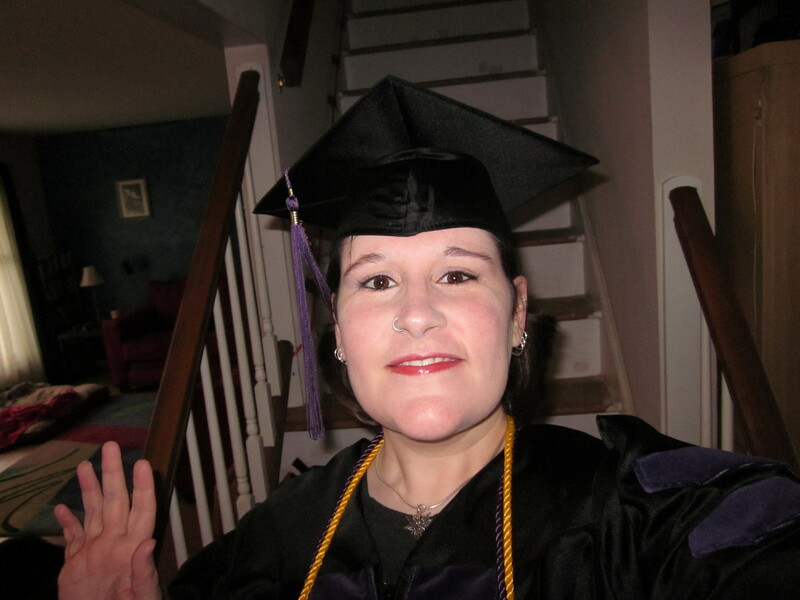 Though I often joke that where I am is unemployed with a Bachelor of Business Administration and a Juris Doctorate (Have Degrees, Will Travel). More than anything though, I think I’ve gotten where I am because I’m not willing to give up, or to accept things that are wrong just because that’s the way things are, or have always been. I went to law school because I disagree with kids being bullied until they commit suicide, because it’s not right that we haven’t achieved equality in the USA in the year 2011, because kids age out of foster care with no real options, because sometimes good people make stupid mistakes, and because sometimes all people really need is someone who believes in their cause and is willing to take up the fight. Is that idealistic? Sure. What’s wrong with idealism? Doesn’t it beat the alternative? There’s plenty more I could write. I didn’t even touch on the 60 mile walk I’m training for because I’m mad about breast cancer or how I’m fumbling though getting my kid off to college while trying to figure out how on earth I’m going to pay for it. I think I’ve made my point though. When life yanks the football from under your feet, you can’t just lie there and feel sorry for yourself. Explore your options, take action, and imagine how good it will feel next time, when the ball is sailing through the air, to look Lucy in the eye and say, “In your face!”. What an inspiration you are to your daughter and other women struggling to make it! Way to go Lucy! An absolutely perfect addition to the summer of amazing stories. Thanks for hosting it, Maureen. Thanks to all the women who have inspired me this summer with their courage, energy, grit, ad resourcefulness. You are wonderful role models for our daughters and granddaughters.